Be clear what you want to get out of any promotional activities, e.g. youth enquiries resulting in membership or partnerships with other community organisations or financial support. Promotional activities can be held at Unit level e.g. ‘Bring a Friend night’, where Guides bring friends who are not Guides, or holding information nights or promoting Guides at local schools or running Open Days. In advance of the events, advertise in school newsletters (this may require building a relationship with the school or finding a parent to make the request to avoid being charged). Another type of Unit activity is one where the Unit is raising money for a cause or raising awareness of an issue. Planning and running a social event or barbecue with attendance from friends and family can work well. It is a multi-purpose strategy, promoting Guiding, inviting potential new members and providing a good chance for media involvement. Another idea is for Leaders to provide activities as part of holiday programs e.g. an hour of knotting games and crafts, with flyers left for children and their families. Wherever possible hold activities in the community and make sure they present a modern image of Guiding e.g. geocaching. PR stalls can be held anywhere there are high levels of pedestrian flows, e.g. council events, school fetes, Bunnings family days, market days, local shows, community information sessions and sports carnivals. There is more information on using PR stalls as fundraising events later in this chapter. Companies developing new housing estates will often be looking for community groups to run activities at community days. They want to create a sense of community to attract people to buy house and land· packages, and as a result will often agree to cover the cost of all the activity materials and make a donation to Guiding on top. However, these events rarely produce good youth or adult enquiries, and are often in areas that are not yet developed enough to sustain a Unit. Instead use the opportunity to lobby for the inclusion of community halls in the master-plan and build a relationship with a view to opening a new Unit in the area in 5-10 years’ time. Running stalls as District events enables you to demonstrate the breadth of Guiding in your area. You can also share the tasks of directing people to your stall, greeting, taking contact details and talking about different Units. Your District may have a display board and Regions may have a sandwich board or pop up banner. If your District / Region doesn’t have these items, you might want to budget for them as part of your District or Region budget. As well as having information and flyers it’s possible to run activities, although be clear on whether you are targeting young Guides, older Guides or adults. Again you can devote time at a District meeting to planning the event, who does what and the kind of activity which might work effectively. People may need to see a Guide PR stall three or four times before they decide to join. The experience of one District Manager in reopening a new District was that it took six stalls at community events before women were interested enough to make contact and enquire about opportunities to volunteer. As the District Manager one of the ways you might be able to support your Leaders is to make school visits to publicise Guiding or to accompany the Leaders when they do this. However, if this is not possible because of work commitments, look to Leaders who work part-time, are students or otherwise available during school times, and mentor and encourage them to build skills to do school visits. Or you could share the task of speaking to schools in your District across your leadership team on a cyclical basis. Perhaps if your Leaders lack confidence or experience in public speaking you might devote some time at a District meeting to talking about what to include in the speech, how to get the girls’ attention, what props and information to take along and practising a little. Your Leaders will have their own ideas of what to talk about but make sure it is broad, covering the opportunities in the outdoors, how the patrol system develops leadership skills, the service projects the girls are involved in and that Guiding is a worldwide movement. Each Department of Education has websites listing schools together with contact information and a private school listing is available at www.privateschooldirectory.com.au. Any school visit will need the permission of the principal. The visit could be as simple as speaking at assembly or you could consider running an activity session at lunch or recess. Even putting together a newsletter notice is a good start. Whenever you are visiting make sure you have enough invitation flyers for the girls. If possible ask the school if you can put a box at the office for enquiry forms to be returned. Give each girl a letter for parents or a brochure and an enquiry form that can be returned. be clear on your goals. Understand what you want to get out of using social media and how it complements your other marketing and communication activities. make sure that Facebook is set up as a closed group. invest in maintenance of the site. Maintaining sites is time-consuming; so it’s another opportunity to appoint someone specifically to this role. Identify one person to be responsible for authorising all the content. Abide by Social Media policies. Make sure you are aware of the social media policies for GGA and your State. Information on this is also available in the Guide Lines here. State Offices hire or lend equipment such as flags, banners, A-frames and display boards to support promotional and PR activities. In addition brochures, flyers and posters are available to support your activities. Some States are able to help produce flyers for District events. It’s also relatively easy to make your own display board – this could be something delegated to the Support Group. If you choose to develop your own posters or flyers they should include the State website address. Check whether you are required to get permission from the State Office for publications and flyers. If using any photographs, videos, films or voice recordings of local Guiding people for promotional purposes, make sure they sign a talent release form for each photograph used. Photos of girls will also require parental permission for use. 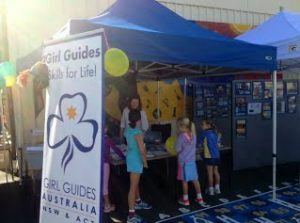 Any use of the Guide logo must conform to Girl Guides Australia policy – it can be downloaded from each of the State websites. If you have good photos or materials with photo release given, consider sharing with other Districts in your Region or State. Units can make up packs of information to give visiting girls including badges, notebook (with Guide sticker) and pen, simple activity as well as a copy of the term program and a welcome letter. Make sure the contents are appropriate for the age group you are targeting. Parents can be provided with a pack that is more information based, for example District overview, uniform information, Support Groups and the Guiding for Adults brochure. Some States have examples of information sheets and letters which you can use to develop your own promotional material. If your State doesn’t, find a volunteer in your District or Region who has writing and / or marketing skills to develop information sheets. 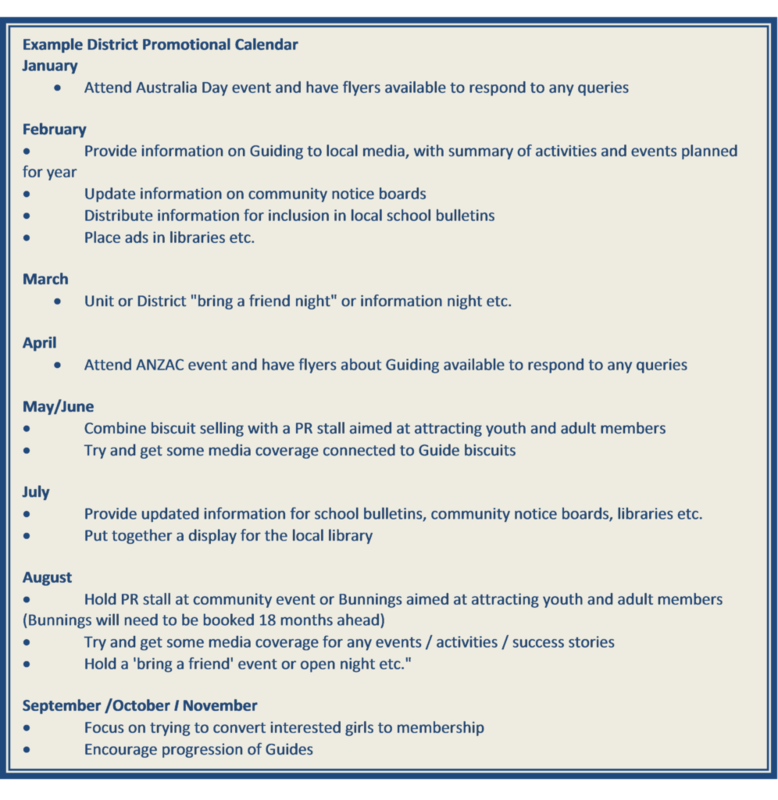 Running promotional events at a District level can share the burden and increase their impact. Ideas include getting involved with community events, such as ANZAC Day or Australia Day, arranging displays at the local library, holding ‘Be a Guide for a Day’ event or running a Guiding information event. Plan your promotional and PR activities so they are spread throughout the year.